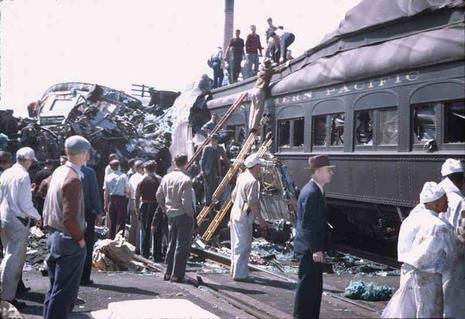 The Naperville train disaster occurred on April 26, 1946 at the Chicago, Burlington and Quincy Railroad station in Naperville, Illinois when the railroad's Exposition Flyer rammed into the Advance Flyer, which had made an unscheduled stop to check its running gear. The Exposition Flyer had been coming through on the same track at 85 miles per hour (137 km/h). 47 people died, and some 125 were injured. According to initial interviews with the train crew, engineer W. W. Blaine of the Exposition Flyer (who survived with a fractured skull) immediately applied brakes upon seeing the first of two warning signals, but it was still too close to the first train to stop in time, and was still traveling in excess of 60 mph (97 km/h) when it struck the rear of the Advance Flyer. This crash is a major reason why most passenger trains in the United States only travel at a speed limit of 79 mph (127 km/h) or below. The CB&Q, Milwaukee Road, and Illinois Central were among railroads in the region running passenger trains at up to and above 100 miles per hour (160 km/h) in the 1930s and 1940s. The Interstate Commerce Commission ruled in 1951 that trains traveling faster must have "an automatic cab signal, automatic train stop or automatic train control system", expensive technology that was implemented on some lines in the region, but has since been mostly removed. Following this disaster, advancements in train speed in the United States essentially halted. 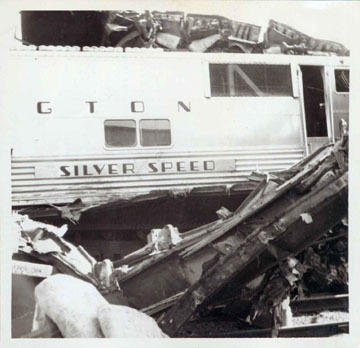 Weary rescue workers Friday counted at least 43 dead in a terrific rear-end collision of the Burlington railroad's westbound fast Exposition Flyer and Advance Flyer Thursday. 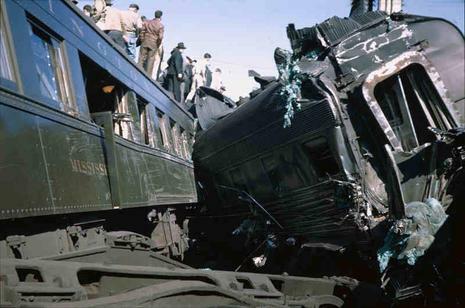 Of 125 persons injured when the Exposition FLyer, speeding at more than 60 miles an hour toward San Francisco, rammed the stopped Advance Flyer, 31 remained in hospitals, some in critical condition. All but 5 of the dead had been identified. The engineer of the Exposition Flyer, who Burlington railroad officials said had adequate warning that the preceding train had stopped, was charged with manslaughter. DuPage county officials said, however, this was a technicality to make certain the engineer would appear at an inquest and that no evidence of laxity had been uncovered. 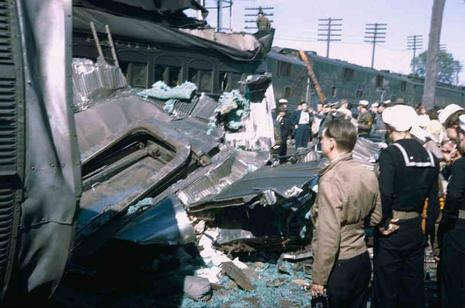 The crash of the 2 steel car, diesel-powered trains occurred just 31 minutes after they left Chicago's Union station simultaneously at 12:35 p. m. CST on separate tracks, with the Advance Flyer, which ran on a faster schedule, in the lead. Two trains, the Advanced Flyer and the Exposition Flyer, had left Union Station in Chicago on different tracks. Traveling several minutes apart, they merged onto the same track several miles outside Chicago. The Advanced Flyer made an unscheduled stop in Naperville to inspect their undercarriage and the Exposition Flyer's engineer did not see the Advanced Flyer's signal lights or the red flag being waved by the rear brakeman. The Exposition Flyer slammed into the back of the Advanced Flyer. At the time of the wreck, Naperville had no hospital. Homes and businesses nearby were set up as makeshift hospitals and the injured were transported to hospitals in Aurora.